This paper describes a method for collecting and analyzing electroencephalography (EEG) data during concurrent transcranial magnetic stimulation (TMS) guided by activations revealed with functional magnetic resonance imaging (fMRI). A method for TMS artifact removal and extraction of event related potentials is described as well as considerations in paradigm design and experimental setup. Sadeh, B., Yovel, G. Extracting Visual Evoked Potentials from EEG Data Recorded During fMRI-guided Transcranial Magnetic Stimulation. J. Vis. Exp. (87), e51063, doi:10.3791/51063 (2014). Transcranial Magnetic Stimulation (TMS) is an effective method for establishing a causal link between a cortical area and cognitive/neurophysiological effects. Specifically, by creating a transient interference with the normal activity of a target region and measuring changes in an electrophysiological signal, we can establish a causal link between the stimulated brain area or network and the electrophysiological signal that we record. If target brain areas are functionally defined with prior fMRI scan, TMS could be used to link the fMRI activations with evoked potentials recorded. However, conducting such experiments presents significant technical challenges given the high amplitude artifacts introduced into the EEG signal by the magnetic pulse, and the difficulty to successfully target areas that were functionally defined by fMRI. Here we describe a methodology for combining these three common tools: TMS, EEG, and fMRI. We explain how to guide the stimulator's coil to the desired target area using anatomical or functional MRI data, how to record EEG during concurrent TMS, how to design an ERP study suitable for EEG-TMS combination and how to extract reliable ERP from the recorded data. We will provide representative results from a previously published study, in which fMRI-guided TMS was used concurrently with EEG to show that the face-selective N1 and the body-selective N1 component of the ERP are associated with distinct neural networks in extrastriate cortex. This method allows us to combine the high spatial resolution of fMRI with the high temporal resolution of TMS and EEG and therefore obtain a comprehensive understanding of the neural basis of various cognitive processes. Transcranial Magnetic Stimulation (TMS) generates momentary interference to the normal neural activity in target areas of the brain. By creating this transitory neural interference and measuring a behavioral or physiological change, we can draw a causal link between the target area and the measured experimental effect (for a review see Pascual-Leone et al. and Taylor et al.1,2). Such an experimental effect may be, for example, a performance on a cognitive task or a change in electrophysiological (EEG) activity. Indeed, in recent years researchers have started using TMS in combination with EEG to directly relate cortical areas with event-related potentials (ERP) or oscillatory activity patterns (e.g.2-7). In this methodological paper we will describe a particular and useful framework for combining TMS and EEG: fMRI-guided TMS during an ERP experiment. First, we will detail how to apply TMS to areas predefined by fMRI, while recording EEG data. We will then describe an experimental design that allows extraction of reliable ERP. The goal of such an experiment is to causally link brain areas revealed with functional MRI to ERP components of interest. Lastly, we will give a specific example of a study relating face and body selective ERPs with face and body selective areas that are revealed with fMRI. What is the benefit of linking EEG signals with fMRI activations? EEG and fMRI are commonly used tools to measure cortical responses to visual input. For example, category-selectivity in the visual pathway was assessed for different visual object categories such as faces, body parts, and written words, both by means of ERP extracted from EEG data8,9, and functional MRI10-12. The signals measured by these two common research tools are, however, of fundamentally different nature. EEG carries information about neural electrical activity with great temporal precision, but very low spatial resolution and may reflect a mixture of many separate underlying sources. The fMRI provides an indirect measure of neuronal activity relying on the slow hemodynamic changes occurring during stimulus presentation or/and task execution, but presents this activity with a higher spatial resolution. Establishing a correlation between the two measures can thus be of great interest, but is limited in that it does not imply a causal link between the scalp-recorded electrophysiological response and the areas revealed with functional MRI. Even when measured simultaneously (e.g.13-15), a directional causal relation between EEG and activity in functionally defined cortical areas cannot be determined. TMS is a tool that can assist achieving the establishment of such a causal relationship. A simultaneous EEG-TMS study is methodologically challenging, mostly due to the high voltage artifact introduced to the EEG signal by the magnetic stimulation (see Figure 1, for a review see Ilmoniemi et al.16). This artifact consists of a transient short living pulse-related disturbance, often followed by a slower secondary (or residual) artifact that may last a few hundreds of milliseconds after the pulse is delivered Figure 2A, thus overriding most ERP components of interest. This secondary artifact may include mechanical sources such as currents induced by the magnetic pulse into the wiring and the slow decay of these currents in the skin, and physiological sources such as muscular activity over the scalp and auditory or somatosensory evoked potentials elicited by the operation of the coil17-20. Although the mechanical sources of interference probably produce larger amplitude artifacts than the physiological ones, these different artifacts cannot be separated, and the existence of any of them in the signal can confound the results. One possible solution is the application of repetitive TMS pulses prior to EEG recording ("offline TMS"), as opposed to simultaneous EEG-TMS. The inhibitory effect of such a protocol on cortical activity persists for several minutes (and up to half an hour) after the stimulation, and EEG can be measured during this effective time window and compared with baseline, pre-TMS, EEG data. Repetitive stimulation, however, is by definition lacking the high temporal resolution that online TMS may offer, where pulses can be administered at a precise timing relative to trial onset at the millisecond resolution. The effect of repetitive stimulation may also propagate via cortical connections across a wider area than desired and therefore significantly reduce the spatial resolution as well. To take advantage of both the spatial and temporal resolution that TMS can provide, a simultaneous EEG-TMS combination can be applied. However, this requires methods for removal of artifacts generated by the magnetic stimulation on the EEG signal. Very few offline mathematical solutions for TMS artifact removal have been proposed16,21,22, although no method is agreed upon, and no one method may be optimal for all experimental designs. A "clipping" system, consisting of a sample-and-hold circuitry, was also developed to momentarily stop EEG acquisition during TMS pulse delivery 20. This technique not only requires specialized hardware, but may not completely remove the residual TMS artifact. In this paper we will describe an adaptation of an EEG-TMS methodology developed by Thut and colleagues19, particularly suitable for ERP studies. This technique allows reliable extraction of ERP while eliminating all the residual noise components caused by the TMS pulse Figure 2. We will further provide general guidance towards a successful EEG-TMS experimental setup. Another challenge in TMS studies addressed in this methodological paper is finding the best coil position and angle for an accurate targeting of the desired cortical area. We will describe the use of a stereotactic navigation system to coregister the subject's head with the pre-acquired functional MRI images. Although the navigation system can be used to localize anatomically-defined brain structures, an fMRI-guided targeting is particularly useful since for many functions and experimental effects the precise location of activation cannot be inferred from anatomical markers alone. For such functional regions of interest (ROI), the definition of an area is made for each participant individually. To illustrate all of the above, we will provide an example of a study we conducted previously, in which EEG was recorded concurrently with TMS guided by fMRI activations7. In this study, a double dissociation was made between face-selective and body-selective ERPs: although face and body ERPs peak around the same latency and electrode sites, targeting individually defined face-selective and body-selective areas in the lateral occipital lobe enabled us to dissociate the neural networks underlying each ERP response. Finally, we will try to give more general advise for optimizing EEG recording during TMS application. The experiment is conducted in two separate sessions. During the first session a functional MRI experiment (e.g. a functional localizer) is carried out in order to define the desired TMS target areas on an individual subject basis. The fMRI results are then fed into a stereotactic navigation system for an accurate TMS targeting. The second session is held following the analysis of the fMRI data, during which EEG is recorded concurrently with TMS. The protocol described here was approved by the ethics committee of the Tel-Aviv Sourasky Medical Center. In the example given in this paper, data were analyzed with MATLAB version 7.7 (R2008b). 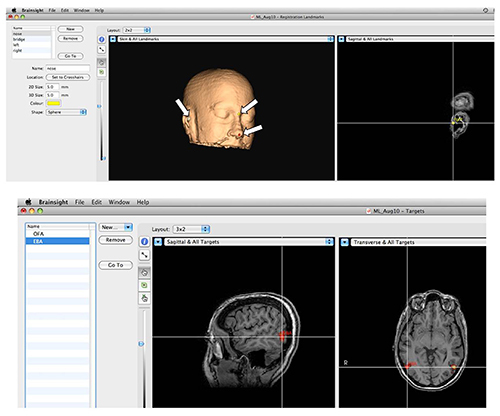 The Statistical Parametric Mapping (SPM 5) software for MATLAB and MarsBar toolbox for SPM 23 were used for fMRI data processing. Run a functional MRI task using an echo planar imaging (EPI) sequence to determine the desired foci of activation to be targeted with TMS. For a better dissociation between adjacent areas, such as the OFA and EBA in the example below, high-resolution scanning is recommended. Voxels of 3 mm3 or smaller, obtained with an MRI head-coil of 8 channels or more, are sufficient for delineating adjacent regions. Run a T1-weighted structural scan to obtain neuroanatomical data. Make sure that the face of the participant is entirely included in the field of view of this scan, since external markers on the image (e.g. the tip of the nose) will be later used to coregister the subject's head with its scan. After data collection, use the MarsBar toolbox for SPM to define the desired brain regions of interest based on contrasts between the experimental conditions. Use the contrasts face>objects to define the Occipital Face Area (OFA), and bodies>objects to define the Extrastirate Body Area (EBA). To further ensure that the two cortical targets are functionally distinct, use "conjunction" (in MarsBar) to mask from each ROI any voxels responding to the other experimental condition (exclude face-voxels from the EBA, and body-voxels from the OFA). Corregister the structural T1 images with the functional scans, using SPM. Copy the files of the structural scan, as well as the relevant functional contrast files, to a portable drive in order to upload to the navigation system. Described in the section below is a method for collecting EEG data during TMS application in a way that allows extraction of reliable and replicable ERPs19. The advantage of this technique is that it easily handles the secondary, long lasting, TMS artifact, and is robust enough even to allow restoration of data at electrodes located right under the TMS coil, where the artifact is of the highest voltage and longest duration. Run the different TMS conditions (the different target brain areas, as well as a no-TMS condition) in separate blocks. Within each block present the participant with all stimulus conditions (e.g. faces, objects, scenes and so forth) randomly in an event-related design. For better quality of ERP and TMS-noise template (below) make sure to have at least 50 trials per condition. Set the timing of the TMS pulse/pulses to the desired latency after image onset. This is done via writing to a parallel port, from which a cable goes to the TMS stimulator. This function is available in most software for psychological experiments, such as Psychtoolbox (versions 2 or 3) for MATLAB 24 or E-Prime (see Materials Table). Jitter the inter stimulus interval (ISI) to reduce stimulus (and pulse) predictability (e.g. add a random value between 0 to 500 msec at each ISI). Prepare trials during which TMS will be applied at the same intensity, but with no stimulus presentation on the screen. These blank-screen TMS trials will be served to calculate a TMS artifact template in the absence of visual stimulation. Set the number of repetitions of the blank trials to be identical to the number of repetitions of any one of the experimental conditions within the block. For an accurate representation of the shape of the TMS residual artifact, randomize the blank trials throughout the whole block rather than presenting them all at the beginning or at the end. Accurate TMS targeting of individually defined ROIs is possible with the use of a stereotactic navigation system, comprised of an infrared camera, infrared sensors mounted on the participant's head, and a specialized software. Screen participants based on TMS safety criteria. Exclude from participation subjects with a self or family history of epilepsy, subjects with other neurological conditions or with frequent migraines, and subjects on psychoactive drugs. Although not typically screened for, subjects with suspicion for autonomic disorders such as vasovagal syncopes (mostly manifested as a tendency to faint easily) may also be excluded. Instruct participants to avoid alcoholic drinks starting the prior evening, and caffeinated drinks at least 2 hr before the experiment. For further instructions and discussion of safety see Rossi et al25, and the Magstim safety review (http://joedevlin.psychol.ucl.ac.uk/tms/docs/magstim_safety.pdf). Before the session starts, feed the structural scan files into the navigation system's software. Overlay the functional MRI results (the contrasts) on the structural images. Using the Neuronavigation software, mark the desired targets on the images, as well as the external anatomical markers that will serve for coregistration: the tip of the nose, the deepest part of the nose bridge often referred to as nasion, and the tragus of each ear. Try to keep electrode impedance not higher than 5 kΩ. To avoid TMS-related heating of the electrodes, use as little gel as possible. To achieve good impedance with little amount of gel perform a thorough skin preparation. Optionally, ask participants to wash their hair before coming to the experiment. Make sure that the electrode wires do not cross each other and are oriented away from the coil's location. Avoid loops in the wires. Use a high sampling rate for a better representation of the noise artifact. It is recommended to use 1 kHz or above, as most previous studies using this method have done7,26-28. Place the reference and ground electrodes as far from the coil as possible. In this example, areas in the occipital cortex were targeted using a nose reference and an Fz ground7. For other examples see3,4,27,29,30. Note that data can be re-referenced offline to a new reference as needed, such as the common average. Note: For a review about optimization of TMS-EEG setup, see Veniero et al31. Mount the infrared detectors on the participant's head. Coregister the head location with the navigation system using the predefined markers (tip of the nose, etc. See Figure 3). It is advised to repeat the coregistration between blocks to ensure accurate coil placement at all stages. Have the subject seated with the chin resting on a chinrest at the desired distance from the screen. Make sure the participants are comfortable at their chair, as they are asked to refrain from movements during the experimental blocks (important for an accurate noise-template measurement). Choose a TMS target from the navigation system Figure 3. Using the pointer tool (see Materials Table), let the navigation system guide the user to the optimal coil location and mark it with a small sticker on the electrode cap. It is important to hold the pointer perpendicular to the head. Repeat this stage prior to each block. Note that it is not recommended to use online navigation during the block (navigating the coil itself while holding it) since any coil movement should be avoided for a best measurement of the TMS artifact template. It was found that predefining and marking the TMS location is the optimal way to achieve stable stimulation. Guide the coil's precise center to the marker, while being held by a holder. Make sure it is tangential to the head. Set the TMS intensity to the desired value. Administer one test pulse for the participant's approval. No-TMS condition: if a specialized sham TMS coil is not available, place the TMS coil next to the subject's head and tilt it in 90°. Run the block as usual, including the blank trials. The reader may also refer to the JoVE video paper by Andon and Zatorre32 for further demonstration of the navigation system. If a clipping device is not available (see above), the first step in the EEG data processing would be to cut out the immediate TMS pulse artifact itself from the data. Note that this step can be skipped if filters are not desired. But if filters are applied, the sharp-edge shape of the artifact will create distortions in the data. A narrow time-window of 10 to 15 msec after pulse onset should suffice, but be sure to verify this by visual inspection of the data. Connect the two cut ends created after pulse removal. Two main methods for accomplishing this have been suggested in previous reports: 1. simply join together the two ends remaining after pulse removal (see Fuggetta et al.26 and Figure 1); 2. interpolate a line between the two cut ends by generating equally spaced values between them7. The equation used for this interpolation is as follows: for each missing data point y at sample x, compute y=y0+((y1-y0)*(x-x0))/(x1-x0) where x0 and y0 are the coordinates for the last data point before the cut segment, and x1 and y1 are the coordinates for the first data point after the cut segment. Both techniques assure that filters can be applied on the data without producing ripples due to sharp voltage steps, as demonstrated in Figure 1. Refer to the work by Reichenbach and colleagues27 for a more complex 3rd order polynomial interpolation. For each experimental block, including a no-TMS control condition if present, calculate an averaged ERP to the blank screen trials by time-locking them to trial start (as if an image had been presented). Subtract this averaged template from each trial of all other stimulus conditions. If several blocks were run for the same stimulation site, do this separately for each block, as the template will be slightly different between the blocks. All other preprocessing and processing steps are carried out as in any other ERP experiment. A concurrent EEG-TMS investigation was used to reveal whether the ERP responses to faces and bodies recorded over the occipito-temporal scalp are dissociated. When visual stimuli are presented, a prominent N1 component is recorded at posterior-lateral electrode sites. In particular, the N1 component is typically larger for faces and bodies than to other stimulus categories8,33. By assessing the effect of stimulation on face and body-selective brain areas defined with fMRI on their respective face and body N1 component, we attempted to reveal whether the face and body N1 responses reflect (at least partially) non-overlapping sources, or rather the same network activity with quantitatively different activation levels. We applied a double-pulse stimulation at 60 msec and 100 msec after image onset (see for example Pitcher et al.34,35), to the face-selective and body-selective areas in the lateral occipital cortex - the Occipital-Face Area (OFA) and the Extrastriate Body Area (EBA) (Figure 4A, see section 1.3 above for definition of the relevant fMRI contrasts). The two areas were stimulated in separate blocks, while subjects viewed images of faces and headless bodies. Results show that stimulation to the OFA enhance the N1 amplitude to faces but not to bodies, whereas stimulation to the EBA enhance the N1 to bodies but not to faces. Figure 2B depicts the face N1 before and after TMS residual artifact subtraction, and Figure 4B shows the specific effect of TMS on the N1 component as a function of stimulated area. These findings show how fMRI-guided TMS during concurrent EEG recording can be applied to assess whether two (or more) neural networks are dissociated, as well as to establish a causal link between a functionally defined brain area and an electrophysiological signal. Figure 1. Data processing. Raw and processed data of a representative subject, at the lateral-occipital electrode PO8. (A) Raw EEG data including two trials, each containing two TMS pulses separated by 40 msec (red arrows); (B) Zoom into the data after pulse removal. The two pulses at each trial are removed from the data by cutting a window around the double-pulse (2 msec before first pulse to 16 msec after second pulse). The cut edges are then connected by interpolation (red arrows) as explained in 4.1.2; (C) The interpolated segment allows filtering without creating edge artifacts. In this figure, a 40 Hz low-pass filtered ERP (red) is plotted against its non-filtered version (grey); (D) As an alternative to interpolation, the free ends that are remained after pulse removal can be joined together (see for example Fugetta et al26, and point 4.1.2 in the text). Here, both methods are compared and show highly similar waveforms (blue and red traces mostly overlap), after low-pass filtering at 40 Hz. Red trace: linear interpolation method; blue trace: no interpolation (connected edges are taken apart for plotting purpose only, to keep consistency of time axis). Please click here to view a larger version of this figure. Figure 2. TMS artifacts and the subtraction technique. (A) Left - ERP time-locked to the presentation of an image of a face, with a double-pulse TMS at 60 msec and 100 msec after image onset. Each line represents an electrode. Note that for some electrodes the immediate TMS artifact is followed by a longer residual artifact. Right – Approximate coil location is symbolized by the two red circles, and a few electrodes are labeled for orientation; (B) Artifact-subtraction procedure. The immediate pulse artifact is removed (concealed), a template of the residual noise is measured based on "TMS only" trials and subtracted from full trials. Adapted with permission from Sadeh et al7. Please click here to view a larger version of this figure. Figure 3. Stereotactic Navigation System. Top: Setting landmarks for corregistration. In order to corregister the structural scan of the head with the actual head position during the experiment, anatomical landmarks are marked on the image as shown by arrows. Then, the locations in space of the same landmarks on the subject's head are provided to the system with the aid of a specialized tracker that is detected by the camera. Bottom: Functional brain areas can be precisely targeted. Activations are overlaid on the anatomical image, and desired areas are marked and saved. During the session the experimenter can load a pre-defined area to target with TMS. Please click here to view a larger version of this figure. Figure 4. Representative results. Double-pulse TMS was applied either to the right OFA or to the right EBA, at 60 msec and 100 msec after the onset of a face or a headless-body image. A dissociation between the face-N1 and the body-N1 responses was made. (A) The two target areas in a representative subject; (B) Left - double dissociation between the face and the body networks. TMS to the OFA enhanced the N1 response to faces, but not to bodies, relatively to TMS to the EBA. The opposite pattern is shown for headless-body stimuli. Right – N1 peak amplitude for faces and bodies, following OFA stimulation, EBA stimulation, and without TMS stimulation. Error bars denote the SEM. This figures was adapted with permission from Sadeh et al7. Please click here to view a larger version of this figure. Having the unique ability to momentarily disrupt normal neuronal activity in selected cortical areas, in precise time points and with a relatively good spatial accuracy, TMS allows to causally link a stimulated brain area with a behavioral or a neurophysiological measure. In this paper we described a method for measuring EEG during concurrent TMS application, targeting functionally defined cortical areas, and applying an analysis that enables a reliable measuring of ERP responses. We gave an example from the literature in which TMS was used in combination with EEG and fMRI to ask whether given fMRI-defined brain areas (i.e. OFA and EBA) are causally associated with ERP responses to their preferred stimuli (i.e. faces and bodies). The subtraction technique described, which was validated19 and applied in several studies7,26,27, has several noteworthy advantages: it allows elimination of the residual long-lasting TMS artifact covering the time-window of most significant ERP components; it equally eliminates the artifact components from muscular, mechanical (electrical interference to the electrodes) and non-desired cortical (e.g. auditory) origins; and it is robust and reliable even in electrodes lying directly under or in proximity to the coil. Note that line noise can also be pronounced in these electrodes, in addition to the enhanced amplitude TMS pulse artifact, since the coil might be touching or lying in close proximity to the electrode or the wires. The technique demonstrated here enables the extraction of ERPs at these electrode sites as well. This is of primary importance since very often the evoked responses of interest originate in or near the stimulated cortical area. Furthermore, recovering signals from the entire scalp is necessary in cases where source reconstruction algorithms are desired. The combination of research tools such as TMS, EEG and fMRI, each putting forward different aspects of neural activity and attacking similar questions from different angles, is a promising move forward in the research of human cognition and brain function. It can be expected that TMS will be increasingly used in combination with EEG to causally associate cognitive or behavioral functions to electrical activity, and to further explore currently developing fields such as synchronization, brain oscillations and connectivity, in high temporal and spatial resolution. We would like to thank David Pitcher for his valuable contribution to this TMS experiment. This research was funded by a fellowship from the Levie-Edersheim-Gitter Institute for Brain Mapping to B.S, a grant from the Wolfson Foundation; grants 65/08 and 1657/08 from the Israeli Science Foundation and a travel grant from the British Council Researcher Exchange Programme to G.Y. The experiment was conducted at the Wohl Institute for Advanced Imaging, Tel-Aviv Sourasky Medical Center. E-Prime software Psychology Software Tools, Inc.
Pascual-Leone, A., Walsh, V., Rothwell, J. Transcranial magnetic stimulation in cognitive neuroscience--virtual lesion, chronometry, and functional connectivity. Curr Opin Neurobiol. 10, 232-237 (2000). Taylor, P. C., Walsh, V., Eimer, M. Combining TMS and EEG to study cognitive function and cortico-cortico interactions. Behav Brain Res. 191, 141-147 (2008). 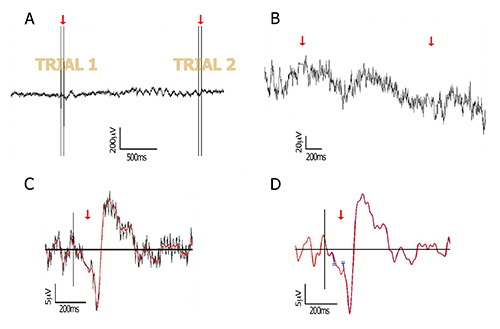 Dugue, L., Marque, P., VanRullen, R. The Phase of Ongoing Oscillations Mediates the Causal Relation between Brain Excitation and Visual Perception. Journal of Neuroscience. 31, 11889-11893 (2011). Massimini, M., et al. Triggering sleep slow waves by transcranial magnetic stimulation. Proc Natl Acad Sci U S A. 104, 8496-8501 (2007). Taylor, P. C., Nobre, A. C., Rushworth, M. F. FEF TMS affects visual cortical activity. Cereb Cortex. 17, 391-399 (2007). 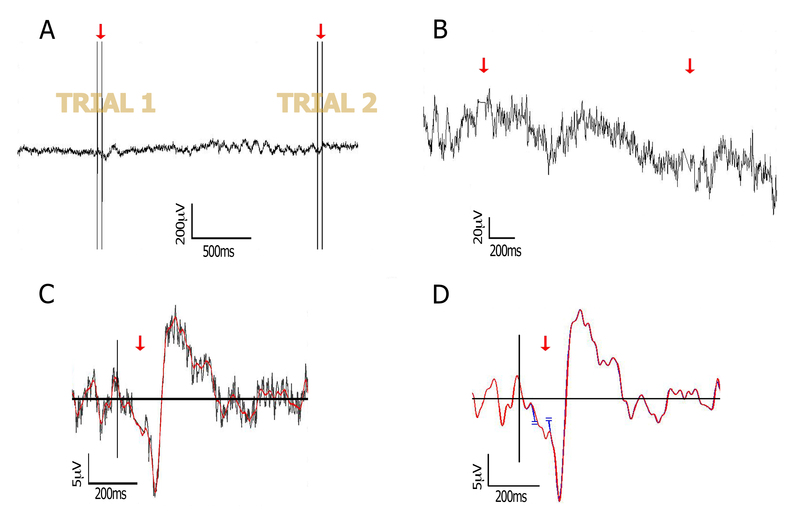 Thut, G., Miniussi, C. New insights into rhythmic brain activity from TMS-EEG studies. Trends Cogn Sci. 13, 182-189 (2009). Sadeh, B., et al. Stimulation of category-selective brain areas modulates ERP to their preferred categories. Curr Biol. 21, 1894-1899 (2011). Bentin, S., Allison, T., Puce, A., Perez, E., McCarthy, G. Electrophysiological studies of face perception in humans. Journal of Cognitive Neuroscience. 8, 551-565 (1996). Rossion, B., Joyce, C. A., Cottrell, G. W., Tarr, M. J. Early lateralization and orientation tuning for face, word, and object processing in the visual cortex. Neuroimage. 20, 1609-1624 (2003). Baker, C. I., et al. Visual word processing and experiential origins of functional selectivity in human extrastriate cortex. Proc Natl Acad Sci USA. 104, 9087-9092 (2007). Kanwisher, N., Yovel, G. The fusiform face area: a cortical region specialized for the perception of faces. Philos Trans R Soc Lond B Biol Sci. 361, 2109-2128 (2006). Op de Beeck,, P, H., Haushofer, J., Kanwisher, N. G. Interpreting fMRI data: maps, modules and dimensions. Nat Rev Neurosci. 9, 123-135 (2008). Okon-Singer, H., et al. Spatio-temporal indications of sub-cortical involvement in leftward bias of spatial attention. Neuroimage. 54, 3010-3020 (2011). Sadaghiani, S., et al. alpha-band phase synchrony is related to activity in the fronto-parietal adaptive control network. J Neurosci. 32, 14305-14310 (2012). Sadeh, B., Podlipsky, I., Zhdanov, A., Yovel, G. Event-related potential and functional MRI measures of face-selectivity are highly correlated: a simultaneous ERP-fMRI investigation. Human Brain Mapping. 31, 1490-1501 (2010). Ilmoniemi, R. J., Kicic, D. Methodology for combined TMS and EEG. Brain Topogr. 22, 233-248 (2010). Julkunen, P., et al. Efficient reduction of stimulus artefact in TMS-EEG by epithelial short-circuiting by mini-punctures. Clin Neurophysiol. 119, 475-481 (2008). Siebner, H. R., et al. Consensus paper: combining transcranial stimulation with neuroimaging. Brain Stimulation. 2, 58-80 (2009). Thut, G., Ives, J. R., Kampmann, F., Pastor, M. A., Pascual-Leone, A. A new device and protocol for combining TMS and online recordings of EEG and evoked potentials. Journal of Neuroscience Methods. 141, 207-217 (2005). Virtanen, J., Ruohonen, J., Naatanen, R., Ilmoniemi, R. J. Instrumentation for the measurement of electric brain responses to transcranial magnetic stimulation. Med Biol Eng Comput. 37, 322-326 (1999). Litvak, V., et al. Artifact correction and source analysis of early electroencephalographic responses evoked by transcranial magnetic stimulation over primary motor cortex. Neuroimage. 37, 56-70 (2007). Morbidi, F., et al. Off-line removal of TMS-induced artifacts on human electroencephalography by Kalman filter. Journal of Neuroscience Methods. 162, 293-302 (2007). Brett, M., Anton, J. L., Valabregue, R., Poline, J. B. The 8th International Conference on Functional Mapping of the Human Brain. Sendai, Japan. (2002). Brainard, D. H. The Psychophysics Toolbox. Spat. Vis. 10, 433-436 (1997). Rossi, S., Hallett, M., Rossini, P. M., Pascual-Leone, A. Safety ethical considerations, and application guidelines for the use of transcranial magnetic stimulation in clinical practice and research. Clin Neurophysiol. 120, 2008-2039 (2009). Fuggetta, G., Pavone, E. F., Walsh, V., Kiss, M., Eimer, M. Cortico-cortical interactions in spatial attention: A combined ERP/TMS study. J Neurophysiol. 95, 3277-3280 (2006). Reichenbach, A., Whittingstall, K., Thielscher, A. Effects of transcranial magnetic stimulation on visual evoked potentials in a visual suppression task. Neuroimage. 54, 1375-1384 (2011). Taylor, P. C., Walsh, V., Eimer, M. The neural signature of phosphene perception. Human Brain Mapping. 31, 1408-1417 (2010). Iwahashi, M., Katayama, Y., Ueno, S., Iramina, K. Effect of transcranial magnetic stimulation on P300 of event-related potential. Conf Proc IEEE Eng Med Biol Soc. 1359-1362 (2009). Zanon, M., Busan, P., Monti, F., Pizzolato, G., Battaglini, P. P. Cortical connections between dorsal and ventral visual streams in humans: Evidence by TMS/EEG co-registration. Brain Topogr. 22, 307-317 (2010). Veniero, D., Bortoletto, M., Miniussi, C. TMS-EEG co-registration: on TMS-induced artifact. Clin Neurophysiol. 120, 1392-1399 (2009). Andoh, J., Zatorre, R. J. Mapping the after-effects of theta burst stimulation on the human auditory cortex with functional imaging. J Vis Exp. (2012). Thierry, G., et al. An event-related potential component sensitive to images of the human body. Neuroimage. 32, 871-879 (2006). Pitcher, D., Charles, L., Devlin, J. T., Walsh, V., Duchaine, B. Triple dissociation of faces, bodies, and objects in extrastriate cortex. Curr Biol. 19, 319-324 (2009). Pitcher, D., Walsh, V., Yovel, G., Duchaine, B. TMS evidence for the involvement of the right occipital face area in early face processing. Curr Biol. 17, 1568-1573 (2007).